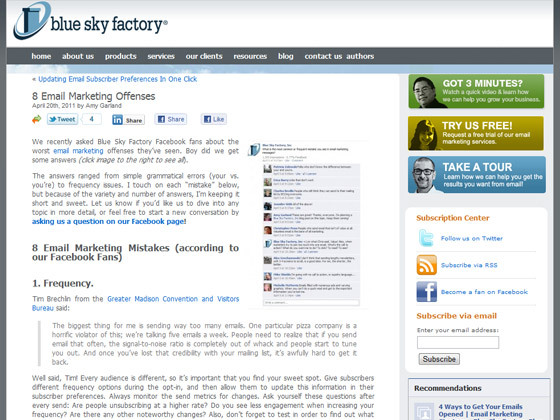 We recently asked Blue Sky Factory Facebook fans about the worst email marketing offenses they’ve seen. Boy did we get some answers (click image to the right to see all). The answers ranged from simple grammatical errors (your vs. you’re) to frequency issues. I touch on each “mistake” below, but because of the variety and number of answers, I’m keeping it short and sweet. Let us know if you’d like us to dive into any topic in more detail, or feel free to start a new conversation by asking us a question on our Facebook page! The biggest thing for me is sending way too many emails. One particular pizza company is a horrific violator of this; we’re talking five emails a week. People need to realize that if you send email that often, the signal-to-noise ratio is completely out of whack and people start to tune you out. 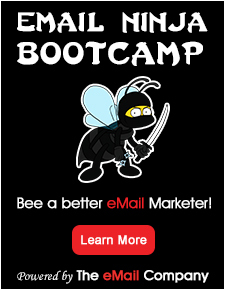 And once you’ve lost that credibility with your mailing list, it’s awfully hard to get it back. Did I mention that you should test, test, and test again? Erica Barry from 1st Mariner Bank answered with “links that don’t work”, and I couldn’t agree more. Nothing is more frustrating than when you receive an email wanting to read more about a specific product, and the link takes you to the wrong page or simply doesn’t work at all. Again, have a co-worker or friend read through, click links, and test before you send your emails. If you want people to convert on your emails, make sure they have a clear – and correct – path to do so.